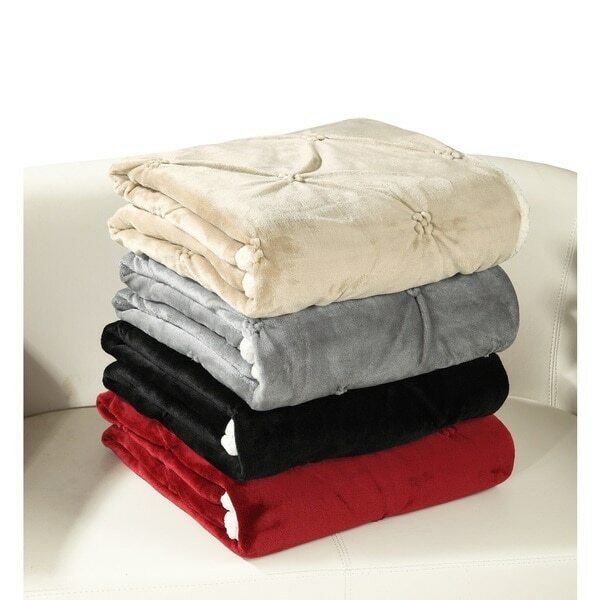 This stunning sherpa lined throw blanket offers warmth and style all year long. A pinch pleat design on an array of solid colors is sure to accent any decor. Softest blanket I own! I gave this as a gift to my daughter. She’s a hotbox while sleeping though and I ended up using it myself. Very warm and the pinch pleats are beautiful. I like this blanket and the only negative is the size...it's a throw true but it could be a bit longer for us tall gals. That said it's a keeper. Love the color and you can literally stick this in the smallest of Bangor carry on and it's warm for lightweight. Have 4 now so when I change out the twin beds on laundry day I can remake them instantly. Love this. I gave these to a friend for Christmas and they loved them! Talked about how incredibly soft & comfotable they are. Great blanket! Super soft and warm! Gift for a family member whose family room is dark brown so I ordered the lighter beige to complement their furniture. Looks like a soft & comfy blanket to curl up in to watch movies. To replace the order that did not arrive. Original choice - good price and looks like a great product.